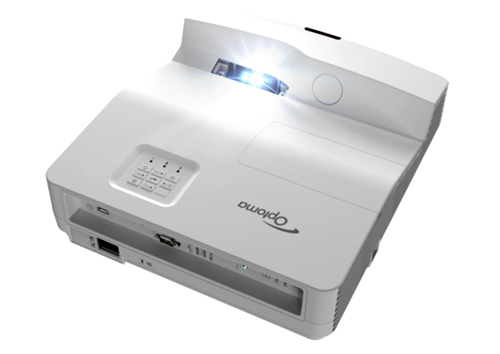 The Optoma EH330UST ($1,599) is an ultra short throw projector with 1080p native resolution and a 3,600 lumen rating. This combination is tempting for home entertainment in ambient light, but the EH330UST is primarily designed for small classrooms, conference rooms, and digital signage. It fits in tight spaces--even retail windows, it is bright enough to stand up to ambient light, it can throw an 80" to 100" image from inches away, and its audio system can easily fill a small room. The 6-segment RGBWYC color wheel targets business and education rather than home use. The white panel puts greater emphasis on brightness--particularly for documents and spreadsheets with a white background--than on color accuracy. For video and film, colors are within a realistic range, but without the level of accuracy or saturation you would expect from a home theater projector. Whatever your intended use, the EH330UST is easily bright enough to stand up to ambient light at moderate to high levels at its maximum recommended 100" image size. The EH330UST reads common office files as well as videos and image files directly from USB memory, and supports wireless mirroring of Mac and Windows PCs and also Android devices. It can display images over wired or wireless LANs from Windows and Mac PCs. Eco modes. The EH330UST's Eco mode lowers lumen output by about 34% compared with Bright power mode. The additional Dynamic mode, which isn't an Eco mode in the usual sense, works like an auto-iris to adjust lumen output based on the content of the image, lowering power use in the process. Color Brightness. The EH330UST's color brightness as a percentage of white brightness ranges from 32% for Bright mode to 72% for sRGB. Cinema is 55%, with the other three modes clustered together at 38% to 45%. Any difference between white and color brightness means that full color images won't be as bright as you would get from a projector with the same white brightness measurement and matching color brightness. However, you won't see much difference with 72% color brightness, will see only a little more at 55%, and even 32% is a higher percentage than many business projectors deliver. Brightness Uniformity. The EH330UST varies enough in brightness across the screen to see a difference on a solid white image, but the variation is minor enough that few people are likely to find it bothersome. As is typical for UST models, the image is brightest where the screen is closest to the lens--at the center bottom with the projector below the screen--and dimmest where its farthest from the lens, at the upper left and right corners. The variation is visible with Word documents and similar images if you look for it, and essentially hidden with images like photos or video that break up the field of view. Color Preset Mode Performance. As one would expect, the Cinema and sRGB modes as the least brightest options deliver the EH330UST's best color accuracy, with Cinema coming closest to a reference image in side-by-side comparisons. At about 1,265 ANSI lumens, Cinema mode is still bright enough to light up a 100" 1.0-gain screen in moderate ambient light. At 900 ANSI lumens, sRGB mode can do the same with a 100" 1.3-gain screen. You can step up in brightness to either Presentation, at 1,625 ANSI lumens, or Game at a nearly matching 1,560 ANSI lumens. Either one can easily fill Optoma's recommended maximum 100" diagonal screen-size with a 1.0-gain screen in moderate ambient light. Presentation and Game offer similar levels of color accuracy. Neither has an obvious color shift. Though not quite as accurate as Cinema and sRGB, the colors are much closer to accurate than with Bright mode. Bright color mode, like the brightest mode in most projectors, shows enough green bias to notice in both graphics and photorealistic images. Colors are also dark, most obviously in photos and video, and lowering the Color Brightness level doesn't help color accuracy enough to be worth the loss in brightness. Even so, most people would consider Bright mode usable if they need the projector's full brightness to stand up to a particularly high level of ambient light. Most preset modes have lower than ideal contrast if you were to use this projector in a dark room. However, in well-lit conference rooms or classrooms the EH330UST is meant for, ambient light compromises blacks anyway, making the EH330UST's brightness more important than contrast. DICOM Sim is the exception on this score, with notably better contrast than the other modes. Video Performance. The EH330UST's video performance is surprisingly usable for a business projector in, say, a family room with low to moderate ambient light. However, in a dark room, the relatively low contrast makes colors look washed out and leaves the picture with no sense of depth. Add some ambient light however and the limitations of low contrast matter far less, while image brightness becomes more important to making colors look more saturated. It also helps if you keep the image at the 80" end of the recommended size range to give colors a little extra punch. Overall, in ambient light, the EH330UST's film and video quality is in the same league as inexpensive home theater projectors in the sub-$700 range, and it even holds shadow detail better than most. As you might expect, it has none of the video processing options, like frame interpolation, that you would expect on a home theater model at this price. Presentation Optimized Lumens. For presentations, the aptly named Presentation mode, using default settings, gives the best balance of brightness and color accuracy. At 1,625 ANSI lumens, it is easily bright enough to light up a 100" diagonal 1.0-gain screen in a bright room. Video Optimized Lumens. With or without adjustments, Cinema mode delivers the closest match to a reference image. At about 1,265 ANSI lumens, it is suitable for the recommended maximum 100" screen in moderate ambient light. As already noted, however, colors will look more saturated with a smaller image size. 3D Performance. As shipped, the EH330UST supports Full HD 3D with DLP-Link glasses. It can also support RF glasses, but only with a third-party emitter. Brightness for the single 3D mode drops less compared with the 2D modes than with most projectors, making it easy to find a single image size that works for both 2D and 3D in any given level of ambient light. I didn't see any crosstalk in my tests. However, I saw more--and more obvious--3D-related motion artifacts than typical, to the point where it was hard to focus on small moving objects in the foreground. The ability to visually merge stereoscopic 3D images varies from one person to another, so this may not be an issue for everyone. However, I've never had this problem with any other projector when watching the same movie. Input lag. The measured input lag in all color modes is 50 ms, which is fast enough for casual gaming. Most serious gamers will find it too slow compared with the 16 ms lag that many projectors offer today. Rainbow artifacts. Optoma projectors have always shown relatively few rainbows. With the EH330UST I saw them only rarely with both graphics and video. However, some people who are particularly sensitive to them could still find them bothersome. If you don't know whether you're in that group, buy from a dealer with a friendly return policy so you can test it for yourself. Fan noise. The EH330UST's Bright (full power) mode is rated at 33 dB and is audible as a mid-frequency whoosh from anywhere in a quiet mid-size room. However, it is the kind of steady sound that fades into the background, particularly in a room with ambient noise. Eco mode, rated at just 25 dB, has a faint steady buzz. If you listen for it, you can hear it in quiet moments from anywhere in a small room, but at normal seating distances from the screen, it also tends to fade into the background. Optoma recommends using High Altitude mode at 5,000 feet and above. With Eco on it sounds roughly the same as using Bright with High Altitude off. With full power, it is significantly louder. If you have to use it, you'll probably want to limit the setting to Eco mode or add sound deadening material around the projector. Onboard audio. The EH330UST's 16-watt mono speaker delivers high enough volume for a small to mid-size room and good, but slightly tinny, sound quality. Lamp life. Optoma rates the EH330UST's lamp at 4,000 hours in Bright mode, 10,000 hours in Eco, and 15,000 hours in Dynamic mode. Lamp replacements are a notably low $59. Warranty. The standard warranty for the EH330UST includes three years for the projector and one year for the lamp. Lens Offset and mounting. The EH330UST's ultra short throw is designed to work with the projector on a flat surface below the screen on in a wall mount above it. With the projector sitting on a table, the bottom of the image is roughly 20% of the image height above the center of the lens. If you don't position it perfectly, you can adjust the image with horizontal and vertical keystone controls or four-corner settings. The low weight--only 8.7 pounds--helps makes setup easy. Throw distance and image size. The EH330UST doesn't offer zoom, so image size is based strictly on distance from the screen. Optoma recommends a diagonal image size of 80" to 100", with the distance from the front of the projector ranging from about 5.5" to 10". The upper and lower limits are defined by the lensing system's ability to focus--which I confirmed when I tried a 110" image with the test unit. If you're willing to accept slightly soft focus over part of the screen, you might be willing to stretch the size a bit past 100". The Optoma EH330UST projection calculator will give you the throw distance range for the image size you want. Keep in mind that the lens is near the back of the projector. To get the distance between the front of the projector and the screen, subtract 12.1 inches from the throw distance. If you need a bright, 1080p image in a tight space, the $1,599 EH330UST is a prime candidate. It can throw a 100" diagonal image from just 10" or an 80" image from just 5" and is bright enough in most of its color modes to stand up to ambient light with a 100" 1.0-gain screen. For presentations, education, and digital signage applications it offers eye-catching color for graphics and crisp resolution for text documents. The EH330UST also delivers highly watchable video, with color well within a realistic range. Overall image quality matches inexpensive home theater projectors, making it easily good enough for business and education. If you're tempted to use it as a TV replacement in a family room, keep in mind that you'll be paying a hefty premium for the ultra short throw. You can get similar image quality for less than half the price with any number of low-end home theater models. At 8.7 pounds, the EH330UST is lighter than its most direct competition, making it easier to set up. Some competing models cost less, but they have shorter warrantees, higher lamp replacement costs, or both. The EH330UST's three-year warranty with one year for the lamp is among the best for its class. The 10,000-hour lamp life in Dynamic mode with a $59 replacement cost will be particularly appealing for budget-conscious education applications. Rounding out the package are the robust built-in audio, the included Wi-Fi adaptor, support for displaying images over a wired or wireless LAN, and Full HD 3D support, all adding up to make the Optoma EH330UST a solid value at $1,599. i am using optoma 142x, it is one of the best outdoor projectors.